I don't really feel like being their centrefold bum of the month. 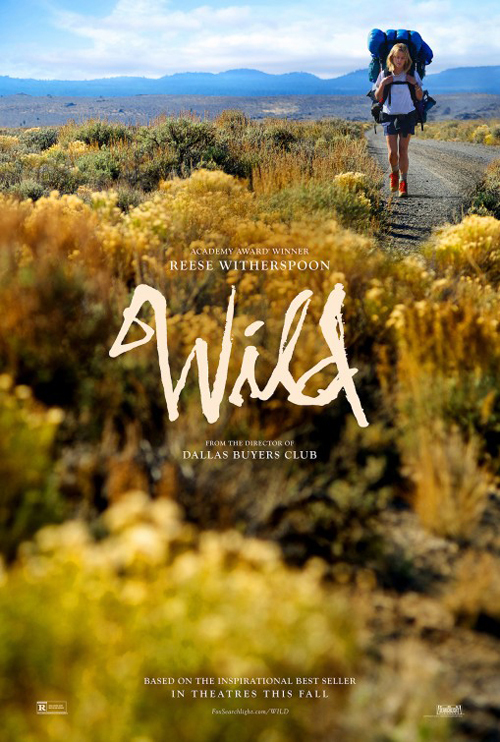 Jean-Marc Vallée’s follow-up to the mostly very good Dallas Buyers Club adapts Cheryl Strayed’s Wild: From Lost to Found on the Pacific Crest Trail, documenting her 1995 trek that’s all in the memoir’s title. Somehow, along the way, Cheryl’s gained a decade and turned in Reece Witherspoon, who is very good, just not 27. The end result is an agreeable if generic travelogue, delivering the expected combination of self-discovery and explanatory flashbacks. Witherspoon’s Strayed elects to trek 1,100 miles of the trail following a divorce and, in the previous few years, the death of her mother and subsequent descent into addiction and wanton abandon. I’ve seen it said that Vallée’s approach here is anti-commercial due to its “free associative, memory-driven narrative”, but that’s really crediting him with too outré a style; this seemed like an entirely conventional device to me, supplying the viewer with sufficient information to keep the nature of her past intriguing, and ensuring it reveals itself in the manner of pieces in a jigsaw. It also does its darnedest to move the viewer in a calculated manner at times, oddly for a film that is attempting to be unvarnished (Cheryl’s encounter with a boy hiking with his grandma and her llama, and the song the kid sings her). So too, Cheryl’s realisations and triggers frequently feel less than profound; compared to the bleak side of this kind of trip found in other true-life dramatisations Into the Wild, or the profound and inspiring one in Tracks, Wild doesn’t really stand out. It might be said that such small, ordinary gains are the point, but it also leads to a feeling of déjà vu; many of the incidents could be slotted into any tale, from trouble with footwear and cooking, to encounters with kindly folk who are assumed to be threatening, to threatening folks who are threatening, to (purportedly) similarly-aged lads who are friendly but shallow. Even if Cheryl doesn’t understand why she’s on the trail, Vallée does, punctuating every incident with remembrances and the pain of loss, ghosts that haunt her as she steers a path to a form of self-acceptance; maybe that’s down to Nick Hornby’s screenplay, since he has a knack of being a safe but literal pair of hands (the final narration forms something of an ungainly bow to wrap things up). But Witherspoon is engaging, and Cheryl’s progress from hopelessly ill prepared to seasoned journeywoman is engaging enough. Yves Bélanger’s cinematography also does its job taking in the beauty of the wilderness. There are even odd moments of quirkiness, such as Mo McRae’s reporter for The Hobo Times who is convinced, despite Cheryl’s protestations, that she is a rare female hobo. Witherspoon is commendably uncossetted and exposed in the role, and strong support is provided from mostly one-scene-and-out players, including Laura Dern (as her unstintingly positive mother, okay, more than one scene), W Earl Brown and Gaby Hoffman.